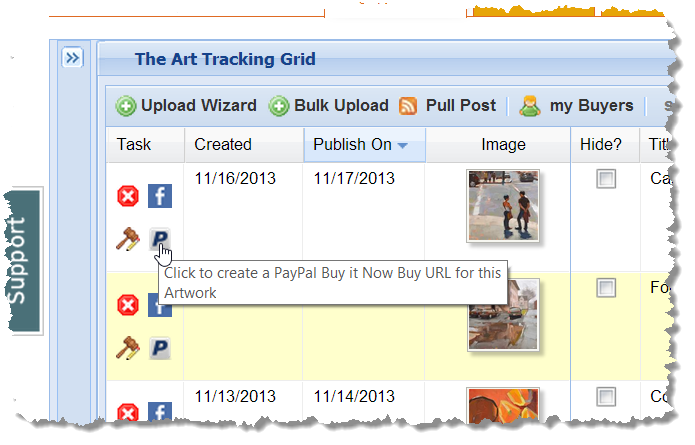 This article is for DPW members and explains how to create PayPal Buy it Now links in your Art Tracking grid for your paintings. Setting up a DPW Auction is very easy, however creating PayPal Buy it Now links for your paintings on the PayPal website is not. 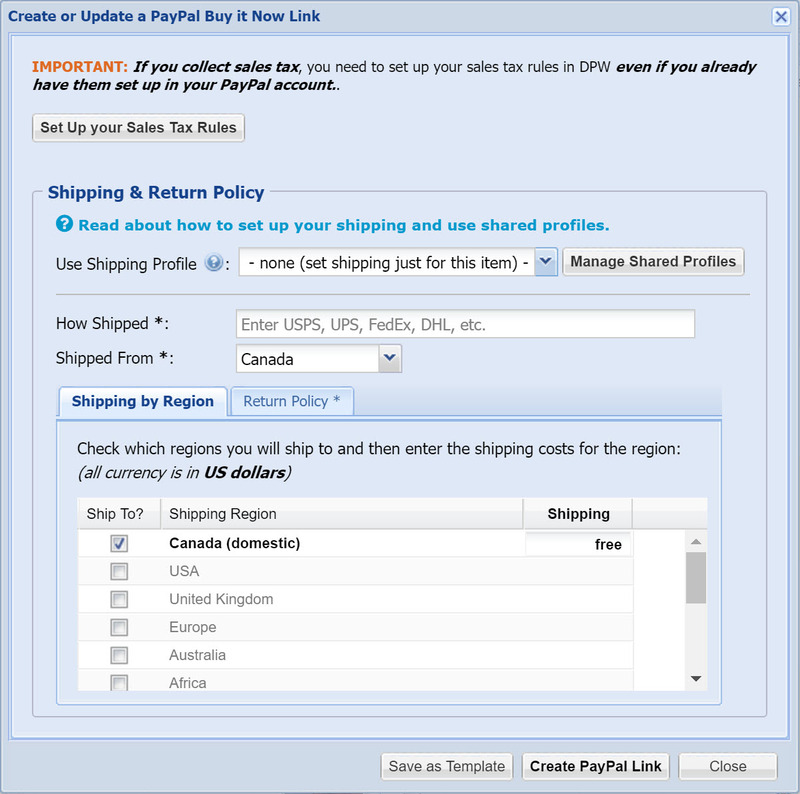 In DPW, creating PayPal Buy it Now links is just as easy as setting up a DPW Auction. 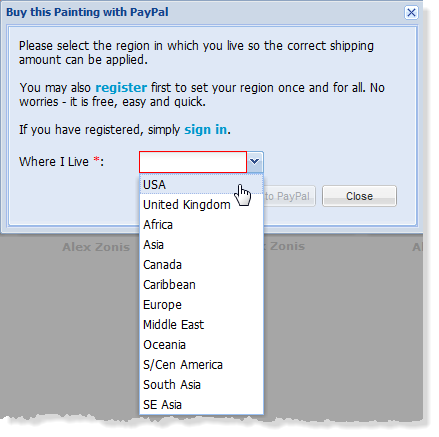 Also, when the buyer clicks on the link when viewing your painting in the pop-up, if they are not logged in, they will be asked in which region do they live, so DPW can set the correct Shipping and Handling (S&H) - domestic or international - for the PayPal page to which they are taken. DPW will even let them know if you do not ship to their region. 1. Sign in, if necessary, and go to your Art Tracking grid. 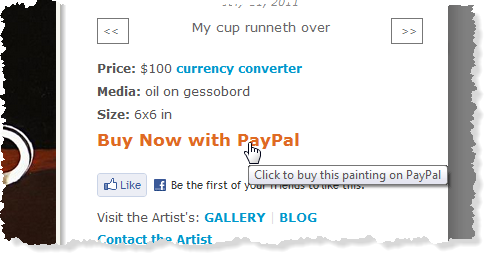 Important: After you have created the PayPal link, you will be presented with a URL that is the same as the URL in the Buy URL column in your Art Tracking grid. You can copy and paste this URL into your blog post, website, and/or emails, if you wish. Using this URL will take your buyer to a page for your painting in DPW where the buyer’s region is taken into account to calculate shipping, as is described below. 4. Click the Create PayPal Link button and you are done! Be sure to set up your DPW PayPal Checkout! Click here to read how to set up your DPW PayPal Checkout so DPW will track your sales and buyers without any data entry by you. Posted - Sat, Sep 3, 2011 at 12:59 PM. This article has been viewed 26723 times.